AP: I certainly didn’t spend my years growing up dreaming of becoming a monk. However, I definitely had an attraction to religion, and the mystique of hermits interested me. But there were no Buddhists in northern Manitoba, or even in Winnipeg, where I attended university. However, I did take an Eastern religions class, which covered Buddhism. This reading motivated me to continue the search. When I finished university, I had a vague idea to study Buddhism some more. I was looking for a way to learn to meditate since I knew from my reading that meditation was essential if I was to continue. I had read mostly Zen books because that was what was available in Canada at that time. Because of this, I had a vague idea to go to Japan. I left Canada in 1972 with a one-way plane ticket to Europe.My plan was to travel overland to Asia, then go down to Australia to work and make money, and then go to Japan. I wanted to get my fill of the world before meditating in Japan. I travelled from Europe, through Turkey, Iran, Afghanistan and Pakistan, to India and Nepal. In India, I kept my antennae out, yet nothing resonated there or in Nepal. A year after I began my travels, I arrived in Thailand. I felt totally comfortable and decided to stay for a while. I wanted to find a place to meditate. The second day I was there, I bought a dictionary and Thai grammar instruction book. It was hot in Bangkok and cooler in the north, so I traveled up to Chiang Mai and stumbled across a monastery which had the Tripitika in English. I stayed at a hotel and went to the monastery to read the Tripitika every day. It happened to be a meditation monastery. There was a German novice who helped arrange a meditation retreat for me. It was a month-long silent retreat, the first meditation I ever did. AP: That really opened me up. I had some powerful experiences of calm and concentration and insight, which made me want to continue to study and practice vipassana. The monks encouraged me to be ordained. I said, “No, I have traveling to do; I’m not ready to make a long-term commitment.” They explained how ordinary it is to do a three-month temporary ordination in Thailand. I thought I could handle three or four months, so I was ordained. It was there that I first heard of Ajahn Chah. One of the other monks encouraged me to visit and pay my respects to Ajahn Chah. I had only been ordained for a month or two before I was given permission to visit Ajahn Chah. I traveled up to Wat Pah Pong to pay my respects to Ajahn Chah and was very smitten. One of the first things he said was that if I wanted to train with him, I would have to stay for five years. That was difficult. I wasn’t ready to make such a commitment. I stayed for about a month and then took leave to go to another monastery,Wat Sai Ngam, where I had an opportunity to do a lot of formal practice. I continued to have many good experiences in meditation.What kept coming up was: “If I am really going to do this, then I have to go back and give myself to Ajahn Chah. Five years is five years. 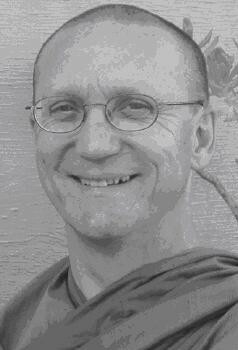 Don’t think about it.” I wrote, and Ajahn Sumedho responded and said I was welcome to come for the Rains Retreat. However, my teacher invited me to spend the Rains Retreat with him instead, and then he took me to Ajahn Chah himself after the Rains. That delay was quite good. I had been all fired up to go back to Ajahn Chah, and then there was an obstacle. I used it to let go of preferences. I also settled in to a lot of formal practice and learned the Thai language, which came in handy up in understanding the Laotian dialect they speak up in Ubon. AP: When you have been ordained somewhere else, you are taken on as a guest monk. Then you observe the practices and decide if you want to make a commitment to stay. The senior monks keep an eye on you, too. After two to three months of waiting, I was accepted. If any of your monastic requisites were not properly acquired, say if you bought something with money, then it had to be relinquished. This happens because most monks use money. Even if you had a robe offered but you had been washing or dying it with detergent or dye that you bought yourself, then Ajahn Chah would require you to change it. There is an excitement to get these new requisites. The robes have been sewn at the monastery. The dye is monastery dye. The robes are real forest monk robes. The bowls are usually bigger because in the forest you carry requisites in them when you are traveling. If it’s raining, you can at least keep some of your robes dry. Also, because forest monks eat from their bowls, the bowl tends to be bigger. These bowls are special, and one looks forward to receiving them. AP: Yes, that was the feeling of going to Wat Pah Pong: It feels as if the tradition has been passed on since the Buddha’s time. There is an antiquity, integrity and simplicity that was so palpable.What struck me was the peace. Things were well taken care of. The diligence of the monks and novices and the commitment of the laypeople were obvious. In such a poor area as Northeast Thailand, the laypeople were out every morning sharing their offerings with the Sangha. On the observance days there were lots and lots of laypeople listening to Dhamma, meditating and chanting. You felt the sense of a living tradition. FM: I’ve heard that the laypeople stay up all night meditating. AP: Yes, they stay up the whole night, once a week on observance nights. For myself, just arriving, it was difficult to sit still for even an hour. You were not sitting still on a zabuton and zafu with a few foam props. You had a one-layer sitting cloth on a concrete floor. Some of the people would sit for two to three hours and then do some walking meditation, and then sit for a few more hours till dawn. Close to dawn you would do chanting. It was awe-inspiring. It also felt so healthy, the interaction between the monastic community and the lay community. There would be people coming to make offerings, ask questions or pay respects to Ajahn Chah. Laypeople would also help out at the monastery. You had a real sense of the monastery being a focus for community. AP: It was in my ninth year as a monk. I hadn’t really planned on it. I had been at a branch monastery that had about a thousand acres of beautiful forest, surrounded on three sides by a reservoir, and I hoped to stay on for a long time. But one of the monks came with a message from Ajahn Chah asking me to return to Wat Pah Nanachat to start to learn the ropes of being an abbot. Because Ajahn Chah asked me to do it, I did it. AP: I found I had to rely on what he saw in me rather than what I saw in myself. It was pretty miserable to have to be in that position, to be perfectly honest. There was obviously a sense of excitement and willingness to take it on because I had been asked to, but it certainly wasn’t easy. It was difficult being in a position of leadership and having more responsibilities, mostly just dealing with people much more. Among the great sufferings in the universe, dealing with people is at the top of the list! From my perspective, I didn’t have a choice. I had to make it work somehow. I had to learn from it. AP: One of the meditation practices I have done from day one, and still do, is mindfulness of breathing. I have experimented with a variety of methods, but mindfulness of breathing is my home base. Of course, it has been refined and become a lot clearer in how to use it skillfully. The Buddha’s teachings have a certain simplicity, and the profundity begins to shine out of that. Other ways it’s really changed is that there is a whole lot more ease than when I started. At the start there were a lot of good intentions and effort, but it was not so easeful. I enjoy the practice more now than when I began. It has so much more clarity and contentment. AP: It’s helpful to share responsibilities and to have somebody to consult with. Furthermore, there is not just one person at the top of the line who is the single role model. Ajahn Amaro and I have different temperaments and provide different models of how to be as a person. It’s also helpful to see that there are different ways to practice. It gives people the opportunity to breathe a bit easier and figure out for themselves what is going to work for them rather than just emulating the ajahn. I’ve tried to keep my focus at Abhayagiri on spending most of my time at the monastery. I want to be available for the training of the monastics, for people who want to take on monastic training, and for people who want to come to the monastery to practice here. AP: There are definitely differences. In Thailand, it is a more autocratic model. That’s just how it works. In America there is an expectation of being involved and consulted in decision making. Also, the tendency of American society is toward so much busyness. We have to be very conscious not to let the monastery get swamped with that same kind of hyper-organization, where everything has to be scheduled and there is very little free time. It’s easy for that attitude to drift over into the monastery. FM: I have heard that in Asia people like themselves more and don’t seem to have as much self-hatred as Americans do. Would you say this is true? AP: I don’t think it’s that people like themselves more. They are just not so confused about themselves, and there is a higher degree of acceptance of themselves. There is not the same kind of complicated analyzing, proliferating and assessing that goes on in Western minds, particularly Americans! AP: I tend to steer people in the direction of what is conducive to harmony. I ask them to be really clear on their virtue, precepts and generosity. People are so wrapped up in themselves, so up in their heads that they don’t recognize the value of fundamental qualities like generosity and kindness. Generosity is not just material but includes generosity of time and serviceand giving of themselves. It gives a lot more confidence. There is a mystique that says: if I figure myself out, then I will be all right. But there is no end to that. People are so distant from themselves. This is why I also emphasize mindfulness of the body. It’s not immediately apparent how important it is to be centered and focused in the body. However, it cuts through the mind’s obsession with itself, its comparing and evaluating. The constant asking of what is the most advantageous thing for me. It goes on and on, this spinning out. Just coming back and being attentive to the body is the antidote. It might be the breath or the sensations in the body, the posture or the elements. The important thing is to be anchored in the body. From Fearless Mountain, the Newsletter of the Abhayagiri monastery, USA, October 2003.